See here again how it start out as four trails, they merge and separate into two trails, and then break up into two swirly trails due to wake eddies. In my photo it looks like the outer trails simply fade out sooner than the inner trails. This suggests that the inner engines are on a higher power setting than the outer engines (and hence produce more water vapor). Very beautiful and interesting ! I’m going to write a paper about the contrails on my blog. I need your science ! I see two at a time often. And going in different directions, not so much parallel like that. Nice photo. 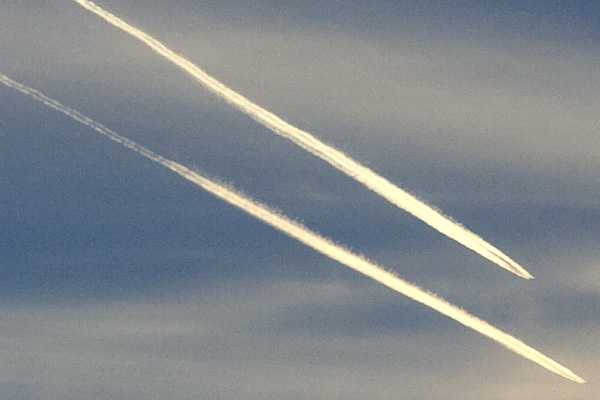 This is the photo someone identified as ‘chemtrails’. Now I can see where some of it is ‘contrails’ but isn’t the main part actually a cloud? I hope this html works. Well, contrails are clouds, if the conditions are right a contrail will spread out and turn into cirrus clouds. What you are seeing here (in the upper part of the photo) is a contrail being spread by wind sheer. 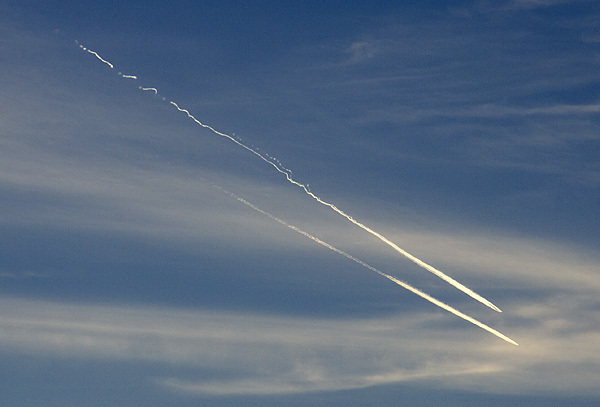 The contrail is essentially smeared across the sky, leaving a trail of cirrus clouds behind it. The lower part of the photo is mostly cloud layer. This gives an indication of how much moisture there was in the atmosphere. The clouds would probably have spread anyway – the contrails just sped it up by adding more moisture and aerosols. I see 2 jets in the sky one leaves trails the other dose not. It is 93 degrees here. Kind of hard for ice to hang out all day. I see these jets turn the trail off then on. Then they fly away like a rocket and are gone in seconds. These are very small extreamly fast jets. Where I live they spray a long run then leave. A bit later you see another and then another ALL DAY. These are not comercal jets. slipknot, while it is 93 on the ground, it can easily be -40 at 30,000 feet. Remember that the planes fly higher than the top of Mt. Everest, and it’s pretty cold up there! When you see two planes and one does not leave a trail, it’s either a different type of plane, or it is flying at a different altitude – even 1000 feet can make all the difference. 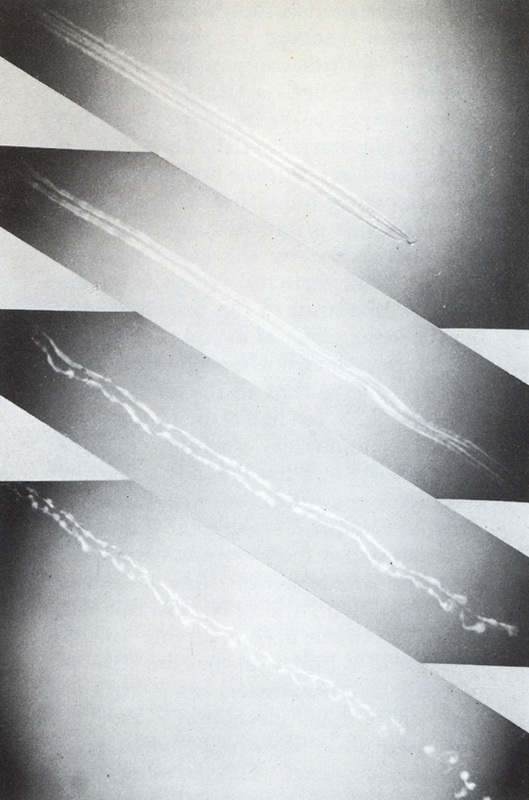 Broken contrails are caused by patchy areas of humidity in the air – a bit like clouds, but not visible until the jet flies through them. Lots of the jets are not commercial jets, but are actual executive-type private jets, which are smaller, faster, and fly higher – in colder air. I found your information very informative, but, there are examples I have witnessed that still defy the explanations you have illustrated. 1) I, and several of my co-workers, witnessed a plane leaving a persistent contrail. It had started up suddenly, like a ribbon that was cut off with a pair of scissors. Minutes later, another plane flew directly through the contrail at an oblique angle, disturbing it visibly. The second plane had no contrail whatsoever. They were both at the same altitude, evidenced by the scattering of the contrail, and the second plane looked the same size and shape, like a commercial airliner. The contrail in question passed within a couple of degrees of the sun, and there was a distinctive pink and green coloration, like a rainbow, only the wrong color. It looked like an oil slick on water rather than a true rainbow coloration, which is what happens when sunlight passes through actual water droplets. 2) I have been an avid sky watcher all of my life, and the nature of the atmosphere is most definitely being affected by airplanes, and this process has greatly accelerated since the mid-nineties. Sure, planes are flying more, with more byproducts, such as the dumped fuel, and actual hydrocarbon exhaust from the engines. Ice particles form over tiny particulate matter in the exhaust. These hydrocarbons, as well as any unburnt fuel, are made of chemicals. No matter how you slice it, the ice doesn’t form without a nucleus, and if the nucleus is a chemical particulate, then what you have is a chemically induced contrail. So, the term chemtrail still applies. 3) About a year ago, I came out at night to observe the stars with my telescope. While I was setting it up, I heard a very low pitched, rather loud engine. I looked up and saw what appeared to be a military C-130 or similar sized airplane flying very low overhead, perhaps at one mile of altitude, not much more than that, as the plane was wider than my palm at arm’s length. That plane was leaving a completely opaque trail behind it, that was still there when I went in perhaps an hour later. It was drifting slowly eastward, and spreading to about three handspans at arm’s length. It was still impossible to see the stars through it an hour later. This took place around midnight. Now, that plane was low, well below 10,000 ft, so the temperature was not cold enough to form a contrail. (I live in South Florida, and it was perhaps May or June, and we were in the middle of a record drought, on a cloudless night, ruling out excessive moisture in the air) This particular trail was more bothersome to me than the other persistent contrails I have seen, because of it’s opacity, low altitude, and the fact that it was directly over my home. There is no good reason for a large plane flying that low to be leaving that type of trail. It went beyond the horizon from my vantage point, so that rules out fuel dumping. There are occasions where the local government will spray for mosquitoes, but they usually use a smaller plane for this, and use it on specific areas where the likelihood of West Nile was high. I agree that not all persistent contrails are part of a vast conspiracy. But, there are anomalies taking place that don’t fall under the “harmless” category. I oppose fuel dumping, because it works it’s way into the plant, insect, animal, and ultimately, human populations. I oppose excess chemicals in the atmosphere for the same reasons, as well as the well-documented Global Warming/Climate Change reasons. We have to live here. There is no other Earth. Taken out of order, for 2), sure you can call contrails chemtrails if you want, but the point of the theory is that chemtrails are something DIFFERENT to contrails. If all you are saying is that jet exhausts and fuel dumping causes pollution, then I’m in agreement, as is everyone. but that’s probably not what you saw, as they spray at 500 feet, not 5000 as you claim, and the trails. I think a more likely explanation is that you miscalculated the height in the dark, and probably saw a LARGER plane flying higher, and leaving a normal contrail. C-130 wingspan is 132 feet, 747 Wingspan is 211 feet. And it was dark. It could even have been something like a Antonov AN-225 (shown here in Florida), overflying at 30,000 feet. I’m not trying to explain away your concerns. Indeed I share your concerns regarding pollution of the air. But I don’t see any evidence of DELIBERATE pollution, and while your observations are slightly unusual, they have many possible explanations. …thus, the light is actually passing through the man-made ice crystals full of combusted petroleum and soot…a frozen “oil slick” as you put it. Can you see the relation between your two observations? Technically, contrails are “chemtrails” as you say…but that is a long way from a clandestine, global in scope, deliberate “spraying” campaign of unknown purpose. Who pay you? CIA? NASA? This sort of response always makes my day. Is there a way for me to send you some contrail photos. I occasionally get some really nice pics. Or you can uploaded them to any photo sharing service , and just post/email a link. Flickr is pretty easy to use, and you can sign in with your yahoo account. This happens also in Greece very often (almost every day) and no one takes officially place for explanations!!! What do you mean by “not normal routine flights”? How can you tell when a flight is normal. Note it’s very hard to see these planes when they don’t leave a trail. So perhaps you only notice the high flying planes when the weather conditions are right. @ Chris ,In witch area of Greece , are you observing the ” not normal routine flights ” ? . ok!When you see 8 high altitude planes at the same time(not normal activity for my region) trying to create a square and after that they vanished you can tell.But there ain’t fools.When people start to talk about they are flying across the tonw limits one or two(sometimes waiting the first to make a vision shield and the others continues upper) at the time using the air direction as a cloud carrier.Believe me if you dont want to see it you won’t no matter what i am telling you, don’t forget people were burned at the past because the claim that earth is round and not square, just have your eyes open and be alerted…. 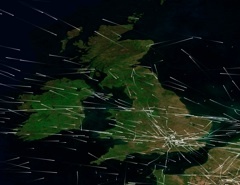 So Chris, what exactly would “normal” air traffic look like over your region? Greece has a LOT of flyover traffic – such as that between Europe and the Middle East. 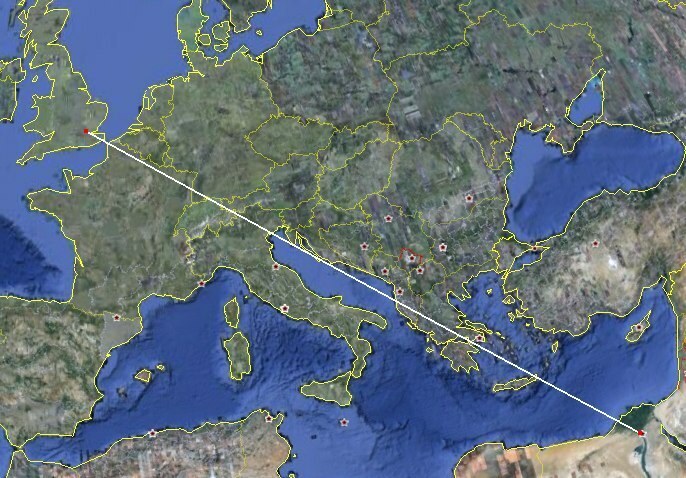 Try looking on a map, or Google Earth, and seeing how planes would fly, say, from London to Cairo, or Rome to Jerusalem – both routes go directly over Greece, and there are several flights a day in both direction, and that’s just two routes – there are hundreds. It’s hardly surprising you see crossing trails in the sky when the weather is right. Since i have no ability to fly this conversation has no ending.I really hope nothing bad runs over our head,but whatever it is, taking place under the sun and ”there no secrets under the sun” as we say here(and we have plenty of sun). What most don’t realize (well I’ll use the US for instance) is that there are over 5,000 planes in the air (not counting military). The chances of planes flying over your area (even small cities) is high, and the chance of multiple contrails left in the sky is also high. It’s been a while since you posted a contrail of the day.